The first part of this book contains reports on legal, political, and economic developments in most Member states of the European Union (Austria, Belgium, Finland, France, Germany, Greece, Ireland, Italy, the Netherlands, Portugal, Spain, Sweden, and the United Kingdom), as well as reports touching upon the enlargement perspective. The second part bring together 'horizontal' contributions on selected problems of the EMU system, transcending national borders : the role of public opinion and of national governments and political parties, the monetary and economic policy coordination in the Third Stage of the EMU and the risk of asymmetric shocks, fiscal policy coordination and discipline and the present and future Stability and Growth Pact, prudential supervision, the specific legal position of Sweden with reference to its non-participation in the common currency , and the functioning of the ECB in an enlarged Union and EMU. The full price for this book when not purchased via the website is: Members £48 Non-Members £80. 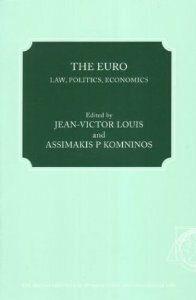 "The Euro: Law, Politics and Economics"